The SIG fosters health promotion and wellness through educational programs at national meetings, webinars and research blasts. SIG members also contribute to the section listserv and website, write GeriNotes articles highlighting wellness news, and participate in other section activities promoting implementation of wellness initiatives and practice. For descriptions and resources related to evidence-based health promotion programs, including those that have undergone the Administration for Community Living Administration on Aging's Older Americans Act Title IIID program submission process please see the National Council on Aging's Center for Healthy Aging. The Health Promotion	and	Wellness SIG shares research blast on "sitting disease"
The Health Promotion and Wellness SIG has posted a new blast cast titled Smartphones and Wearable Activity Trackers to Measure and Promote Physical Activity. As physical therapists and physical therapist's assistants we regularly engage in promoting active lifestyles and assisting patients with physical activity behavior changes. It is important for us to be familiar with the measurement accuracy and effectiveness of popular technology for monitoring physical activity. The goal of this blast cast is to provide readers with contemporary references about: (a) the accuracy of some of the most popular devices and applications for tracking physical activity and (b) how they may be used to promote activity among patients. Please direct questions or comments about the blast cast to Gina Pariser, Vice Chair-HPW SIG ([email protected]). In addition to exercising regularly, there is growing evidence that reducing sedentary behavior (independent of exercise) may play a significant role in reducing chronic diseases such as obesity and diabetes, and minimizing declines in mobility associated with aging. Hence, a new model for physical activity promotion that emphasizes reducing sedentary behavior and increasing time spent doing light-intensity activities, such as standing and walking short distances, has been advocated. Increased sedentary behavior in aging adults may be associated with fatigue and musculoskeletal pain. Physical therapists and assistants possess the expertise needed to help older adults reduce sedentary behavior and engage in more light-intensity activity comfortably. Following are annotated abstracts of three contemporary articles related to this topic as well as links to the published abstracts Happy reading and please share your interventions for reducing sedentary behavior on the Academy of Geriatric Physical Therapy listserv. A goal of the HPW SIG is to develop a database of references pertinent to physical therapy involvement in health promotion and wellness and to generate related discussion. Reducing Sedentary Behavior: A New Paradigm in Physical Activity Promotion. Marshall S, Ramierz E. American Journal of Lifestyle Medicine. 2011: 5(6) 518-530. There is a paucity of literature on interventions to reduce sedentary behavior. The purpose of this article was to propose a 5-phase framework outlining a series of steps for reducing sedentary behavior and ultimately improving public health. The 5 phases include: 1. Research on causal relationships between sedentary behavior and health, 2. Development of valid measurements of sedentary behavior, 3. Identification of modifiable correlates of sedentary behavior, 4. Development of interventions to reduce physical inactivity, and 5. Implementation and evaluation of the effectiveness of proposed interventions. Addressing the Nonexercise Part of the Activity Continuum: A More Realistic and Achievable Approach to Activity Programming for Adults with Mobility Disability. Manns P, Dunstan D, Own N, Healy G. Physical Therapy, 2012: 92(4): 614-625. 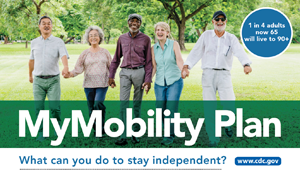 Major purposes of this article are to discuss: (a) what is known about the consequences of sedentary behavior in adults with and without mobility disability (defined as impairments that limit the way adults walk or move within the home or community) and (b) clinical implications related to reducing sedentary behavior in adults with mobility disability. Examples focus on adults with stroke and spinal cord injury. American College of Sports Medicine Position Stand. Quantity and Quality of Exercise for Developing and Maintaining Cardiorespiratory, Musculoskeletal and Neuromotor Fitness in Apparently Healthy Adults: Guidance for Prescribing Exercise. Garber CE, Blissmer B, Deschenes MR, et al. Medicine & Science in Sports and Exercise. 2011: 43(7) 1334-1359.
moderate-intensity aerobic exercise for > 30 min/day on > 5 days/week (totaling 150 min/week), or vigorous-intensity aerobic exercise > 20 min/day on > 3 days/week (totaling to > 75 min/week), or a combination of moderate and vigorous exercise to achieve a total energy expenditure of > 500 to 1000 MET min/week. The ACSM states that the exercise program should be modified according to the individual's physical function, health status, physical activity behaviors, and goals. This Position Stand provides an excellent summary of quantity and quality of scientific evidence on the benefits of physical activity and exercise prescription. Special thanks to Gina Pariser, PT, PhD and Jen Sidelinker, PT, GCS for developing this research update. Anyone interested in assisting with future updates are welcome to contact Gina Pariser [email protected]. As physical therapist we are regularly involved in motivating people with different backgrounds, personalities, and goals. The goal of this HPW blast cast series is to help physical therapy professionals keep up to date on current evidence and best practices related to motivating patients to adopt healthy behaviors. The series will include three blast casts. The purpose of this first blast cast is to highlight some resources that may be helpful to you in updating your knowledge related to behavior change theories and techniques. The planned purpose for the second blast cast is to acknowledge barriers physical therapist's may face in implementing patient motivation best practices and discuss ideas for overcoming these barriers. The third, and final, blast cast in the series will be about motivating patients within a continuum of care with emphasis on physical therapy referral and partnerships with evidence-based chronic disease self-management programs. In this first blast cast we have tried to offer a little something for everyone, whether it is in bite size or full meal portions, print or podcasts. Theories of behavior change. Communication for Governance and Accountability Program, The World Bank, Washington, DC. This easy to read document consists of overviews of contemporary behavior change theories as well as ways these theories may inform your practice. The handbook of health behavior change. 3rd edition. Editors: SA Shumaker, JK Ockene, A Riekert. Springe Publishing Co, 2008. A matter of motivationbyCharles Hayhurst. This PT in Motion article (August 2013) includes patient-centered practical tips and strategies for motivating behavior change in our patients, while being mindful of and sensitive to their stage of readiness for change. Best practices for physical activity programs and behavior counseling in older adult populations. Cress ME, Buckner DM, Prohaska T, Rimmer J, Brown M, et al. Journal of Aging and Physical Activity, 13, pp 61-74; 2005. This article summarizes best practices for promoting physical activity in older adults, especially those with chronic disease and low levels of physical activity and fitness. Full text available through APTA's Open Door. Physical activity behavior change in persons with neurologic disorders: Overview and examples from Parkinson Disease and Multiple Sclerosis. Ellis T, Motl RW. Journal of Neurological Physical Therapy. 37, pp 85-89; 2013. This article summarizes current evidence on the prevalence of profound physical inactivity in individuals with physical disability, and the known benefits of physical activity for those with PD and MS. The Social Cognitive Theory is described suggested as an effective strategy for facilitating physical activity behavior change in these populations. Full text available to Neurology Section members. Special thanks to Gina Pariser, PT, PhD and Jen Sidelinker, PT, GCS for developing this Blast Cast. Anyone interested in assisting with future updates are welcome to contact Gina Pariser [email protected]. Connect with colleagues, post, and discuss innovative practices for prevention, wellness, fitness, health promotion, and management of disease and disability. Housed within the Administration of Community Living of the US Department of Health and Human Services designated to carry out the provisions of the Older Americans Act of 1965. Includes support for health, prevention and wellness programs as well as other services. Evidence-based health promotion and disease prevention program descriptions, resources and toolkits. Interdisciplinary organization dedicated to promoting active aging as a solution to improving quality of life for older adults. Sponsor of Active Aging Week in September of each year. Wellness articles, videos, and webinars available. Promotes physical activity across all sectors of society through building partnerships. Webinars, ACSM/NPAS Physical Activity in Public Health Specialist (PAPHS) certification exam preparation, free membership, and other resources available.